In 1947, Stravinsky visited the Art Institute of Chicago and viewed a series of engravings by the 18th-century artist William Hogarth, entitled A Rake’s Progress. These eight scenes, which traced the descent of Tom Rakewell from respectability to debauchery to madness, struck him immediately with their dramatic potential—and thus, the seed was planted for what became his neo-classical operatic triumph, The Rake’s Progress. What were these artworks that so sparked his imagination, and who created them? 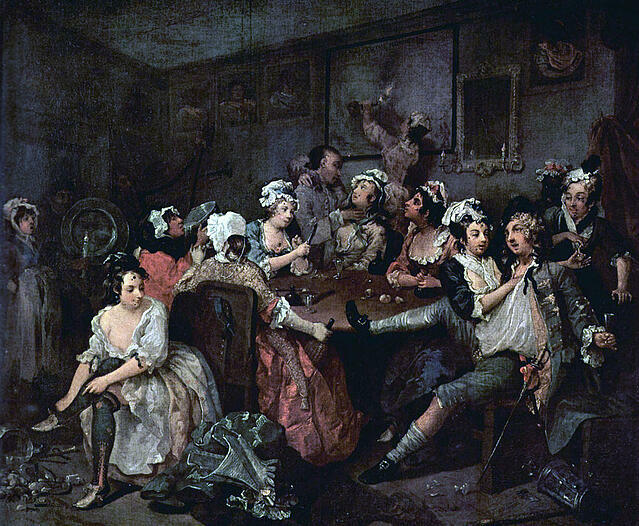 William Hogarth was born in 1679, in London. His father, Richard Hogarth, was an unsuccessful Latin teacher and textbook writer. The family was poor, and after a failed business venture, his father was sent to debtors’ prison for five years. The infamous Fleet Prison generally held about 300 prisoners and their families, so Hogarth was exposed to hardship at a young age. Apprenticed to an engraver, he learned the trade and took up oil painting, for which he had a natural talent. 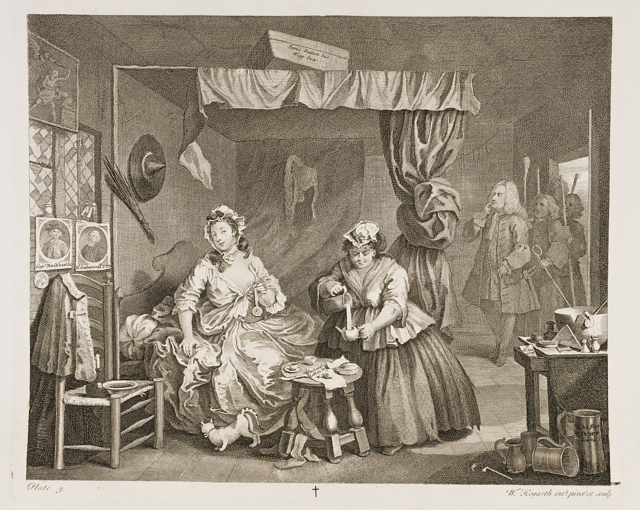 By 1720, Hogarth had become an engraver in his own right and begun his early career. Hogarth was very concerned with the morality of his fellow citizens and turned a keen observational eye to the people of London—from the heights of society to the bawdy company of the streets—that he illustrated. Hogarth is often credited as the founder of sequential art, pioneering art that told a story through depicting images in sequence, laying the groundwork for later forms such as cartoons as well as the film storyboards of today. One of his first great artistic successes was called A Harlot’s Progress (1731), a series of six paintings that showed the story of a young woman who arrives to London from the country and falls into a life of prostitution. Hogarth first painted the third in the series, which depicts the young woman as a prostitute in her bedroom. Having finished it, he was struck with the idea of showing scenes from her earlier life—and thus, the sequential series was born. A Harlot’s Progress was destroyed in a fire in 1755, but the original engravings have survived. A Rake’s Progress came soon after and follows a similar theme and story. Hogarth painted the eight scenes over the course of 1732–33, then created engravings of them and published those in print in 1734. The story follows Tom Rakewell, who inherits a sum of money after the death of his father, rejects his pregnant fiancée to go to London, and proceeds through a series of bad choices to debauchery and debt, until he ends up insane and locked in Bedlam Hospital, London’s notorious mental asylum. See the full series of eight paintings/etchings, along with the original descriptions of the story, here. The images, a series of dramatic tableaux, struck Stravinsky immediately. Back in Los Angeles, where the composer lived, he was introduced to the poet W.H. Auden as a librettist for the opera. Auden, a fellow neo-classicist and an avid opera fan, brought on Chester Kallman to the project as a collaborator. Auden and Kallman made some changes to Hogarth’s story—for instance, Tom’s simple, pregnant fiancée from the paintings becomes Anne Trulove, an innocent, devoted, operatic ingénue. In perhaps the most substantial change, the librettists introduced the character of Nick Shadow, a devilish tempter who leads the willing Tom down a path to his own destruction. In the Hogarth paintings, Tom’s poor choices are all his own; with the addition of Shadow, the opera harkens more closely to the many operatic retellings of the Faust story. 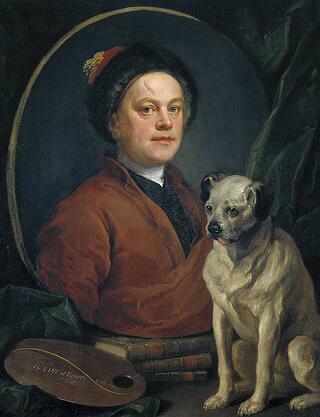 In his own time, Hogarth won both fame and fortune. He became a Freemason, painted portraits of London’s upper crust, and befriended some of the city’s great artists and thinkers, including Francis Hayman, Henry Fielding, and Laurence Sterne. He is remembered best as a satirist and a storyteller, as well as through Stravinsky’s enduring work, The Rake’s Progress.